Founded in 1997, SkinCeuticals discovers, develops, and delivers innovative dermatology products that improve the overall health and appearance of the skin. Early in our history, a SkinCeuticals research team helped pioneer the advent of cosmeceuticals with the original topical vitamin C formula that protects skin from premature signs of aging caused by environmental damage. SkinCeuticals continued to lead the industry as one of the first companies to provide scientific evidence to support product benefits -- publishing clinical studies in respected medical journals usually reserved for pharmaceutical research. 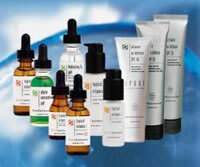 Visit www.SkinCeuticals.com for product information or to purchase online.